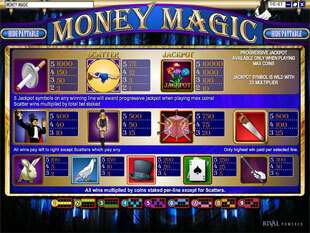 Money Magic Slots is a 5 reel 9 line video game created by Rival. It invites you into the atmosphere full of miracles and magic. Playing this fairy tail game you can win the top jackpot of 10,000 coins. 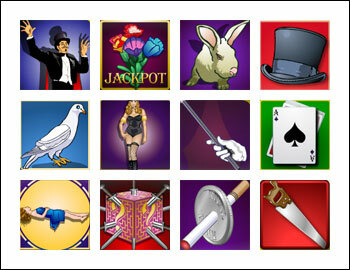 You also can play with maximum bet and win impressive progressive jackpot if you are lucky enough. This slot can be played in no downlaod version directly through the browser without installing special software on your computer. You can enjoy such bright icons as Flowers, Lady Assistant, Magician, Magician’s Hat, Rabbit, Magic Wand, Dove, Cigarette, Cards, Saw, Lady Assistant in Black, Dagger. All of them can present you quite attractive prizes as well as a good mood. There is only one coin size – $0.05. Thus, the minimum bet that allows you to play with all 9 lines is $0.45 while the maximum bet of this game is $2.25. The highest jackpot is 10,000 coins or $2,500 for 5 Flowers. The second jackpot is 1,000 coins or $250 for 4 Flowers or for 5 Cigarette. The third highest jackpot is 800 coins or $200 for 5 Saw. You also can win progressive jackpot in case you play with maximum coins per line and get 5 Flowers on the reels. The Flowers is the wild symbol. It can substitute any other icon except the scatter to produce more winning combinations for you. The other great thing is that this icon doubles your prizes every time it appears in winning combination. Thus, you can get 2,000 coins or $500 for 4 Cigarette with 1 Flowers instead of 1,000 coins or $250 for 5 Cigarette. The Lady Assistant is the scatter symbol. Get 2, 3, 4 or 5 Lady Assistants on the reels and multiply your total bet by 1, 3, 12 or 75 times accordingly. In other words, you can get up to $168.75 per spin if bet maximum $2.25. You should play with maximum 5 coins per line in order to get the opportunity to win progressive jackpot. All you need is to bet maximum and get 5 Flowers on the reels. You can see the ticker of progressive jackpot above the reels to find out how much you can get. 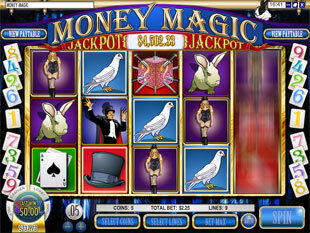 Money Magic slot machine is a simple game with attractive prizes and amazing graphics. Enjoy the mysterious world of magic and try to win the best awards relying on your luck.